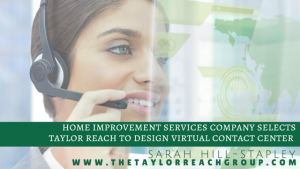 Home Improvement Services Company Selects Taylor Reach to Design Virtual Contact Center | The Taylor Reach Group Inc. Customer Experience (CX) and Contact Center consulting firm, The Taylor Reach Group, Inc., announced today that they have been selected to design and develop a virtual Contact Center for a home improvement services company. The virtual Call Center will effectively and efficiently expand the customer’s Contact Center and improve the recruiting catchment area. The new structure will reduce operating costs, improve employee satisfaction and decrease employee turnover rates. Taylor Reach will size the Virtual Contact Center, identify appropriate telephony and other technologies to support the client’s business activities, and create or revise position descriptions and operating processes and procedures to support the new Virtual requirements.